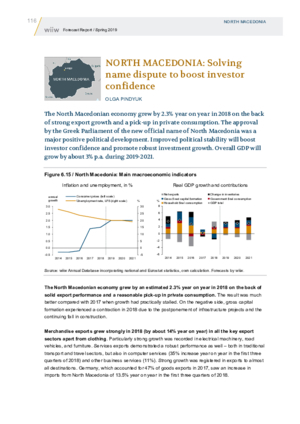 The North Macedonian economy grew by 2.3% year on year in 2018 on the back of strong export growth and a pick-up in private consumption. The approval by the Greek Parliament of the new official name of North Macedonia was a major positive political development. Improved political stability will boost investor confidence and promote robust investment growth. Overall GDP will grow by about 3% p.a. during 2019-2021.